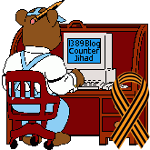 Blogburst: Pentagon not the only department letting Muslims cover up terror threats — 1389 Blog - Counterjihad! The military’s top expert on jihad ideology was fired last week at the behest of a Muslim aide to Deputy Secretary of Defense Gordon England. The aide is a friend to the grand-daddy of all modern Islamic terror groups, the Muslim Brotherhood. His influence is penetration of the top levels of the Pentagon by our terror war enemies. What happened in the Park Service’s Flight 93 memorial investigation is very similar. Our last three blogbursts exposed how two Muslim academics fed the Park Service blatantly dishonest excuses for the giant Mecca oriented crescent in the Murdoch-designed memorial. 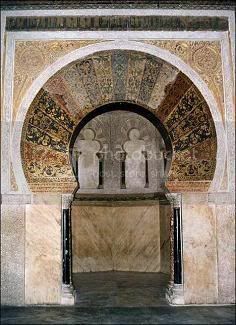 Kevin Jaques from Indiana University said that the similarity to an Islamic mihrab should be ignored (a mihrab is the Mecca direction indicator around which every mosque is built) because there has never been a mihrab anywhere near this big before. Cordoba mihrab points south. Mecca is east-southeast of Spain. The Crescent is a debatable Islamic universal symbol. Many groups do not use it. I know in fact of no militant group that uses it. Islamic modern states have opted to use it, sometimes with the star, which is a modern symbol with no Islamic connotation. Appearing on the vast majority of Islamic flags is “no Islamic connotation”? Rabbat is a professor of Islamic architecture. Mosque design falls within his field of expertise. He knows the traditional crescent shaped mihrab better than anybody and just lies about it, the same way he lies about mihrab orientation having to be exact. When the terror groups have the crescent embrace the globe, they mean that Islam will one day rule the world and subjugate all the infidels. Perhaps a better question is whether there are Islamic terror groups that do not identify with the crescent. At both the Park Service and the Pentagon, Muslim consultants who are engaged in blatant cover up of terror threats are being given the last word by top level administration officials. Let’s get those Congressional Investigations going. To join our blogbursts, email Cao (caoilfhionn1 at gmail dot com) with your blog’s url. This design is so obvious: not being able to see that beggars belief! 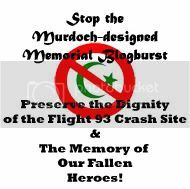 I am being to wonder if they will put some minarets around Ground Zero: that would be an equivalent gesture. What’s it going to take? The PC leftoids will have a lot to answer for one day. Go ahead and do a translation for your own blog or publication. Just put a link back to this site. Previous post: Rudd’s first international challenge?